I was passing few times diferent spots in Peru as Tomas. I was looking more for surfing placies as for turists atractions. 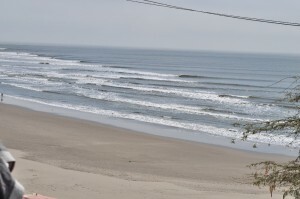 I start my surfing trip in lovely Huanchaco (Point break – Right, Beach Break), which is small village next to Trujillo ( http://triper.sk/?s=huanchaco ), where I bought the board. I couldn’t stay more there as 3 days because I had a meeting with Tomas in Mancora Peruvian the most famously city for holydays. We have been separated from Bolivia because I was Climbing Illimani (http://triper.sk/2010/07/09/illimani/ ) and Tomas Machu Picchu (http://triper.sk/2010/07/09/mp-trip-pix/ ). 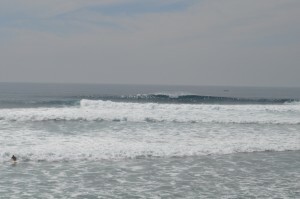 Macora meeting was short , just one day surf on 1h close beach ( Cabo Blanco – very nice waves!!! – Right, Reef break) with evening drinks and continue to Ecuador, passing Montanitu the best Ecuadorian surf spots , (Beach break) and fabulouse place for parties . We just slept there :0))))))) and morning little bit sick was heading to Puerto Lopez, where we met with Branko and Lucka. Puerto is famous for whale watching and close to village you can surf also on absolutely virgin beach 10min, by local bus ( very loudly music in every super fast bus :))))) Beach breaks ). This was my last spot where I was surfing, because after that, we travelled inside in countries Ecuador and Colombia, which was little bit uncomfortable for me with a board. After 2 weeks I gave up visiting cities and created plan to get immediately on Caribbean site without visiting Venezuela, where I heard about possibilities for surf. Upon arrival I went, direct to small village Taganga , which is entry gate to Tayrona national park where I went next day ( http://triper.sk/?s=Tayrona+ ). In this lovely place I stayed 3days. I found out to on Colombian Caribian site, there are no waves in this part of year ( actually I visited one Mendihuaca, but it was heavy beach break which was just smashing me down !!!!!) 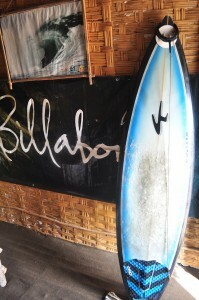 I meet there one surfer, who ask and told me , what I’m doing here???? Just rapidly go to Panama to Santa Catalina you will enjoy there. This all happened immediately , took the bus to Cartgena where I manage boat to Panama. ( http://triper.sk/?s=Boat+to+panama ). On this spot I was waiting till Tomas will finish his trip around Venezuela. Meeting point was Leon , where we planned make our dream Volcano boarding. From this point we have been travelling again together via El Salvador, Honduras, till we again split up at Lago Atitlan ( Guatemala ) Tomas was heading back to Honduras, on Carribian site and me immediately crossed borders with Mexico to San Cristobal ( http://triper.sk/2010/11/17/san-cristobal-de-las-casas/ + Tomas photos ) one of the most famose Mexican city where I also visited San juan de Chamula Maya village ( http://triper.sk/2010/11/18/san-juan-chamula/ ) . I did small trips around, what I handle in one tour. Cascadas azul ( http://triper.sk/2010/11/23/cascadas-azul/ ), Cascada Mishol Ha ( http://triper.sk/2010/11/23/cascada-mishol-ha/ ) and Palenque ( http://triper.sk/2010/11/25/palenque-mexico/ ). After all this 16h trip I took overnight bus for another 12h, for Pacific site, to small village Barra de La Cruz ( world class waves reef break, left http://triper.sk/2010/11/28/ ) where i was again waiting for Tomas. I passed there Dengue fever, so I surfed there maybe 5 times :((((( ….absolutely top place for surfing and for a local life, because there is no possible the foreign investments. The next spot were I went was Puerto Escondido, where is one of the bigiest Beach breaks on the world, and the best Mexican barrels….